and creativity. Technical skill will only take you so far if you haven't the creative drive to back it up, whilst you can have all the inspiration in the world but, if you're lacking the know-how needed to put your ideas into action, you'll ultimately end up frustrated. 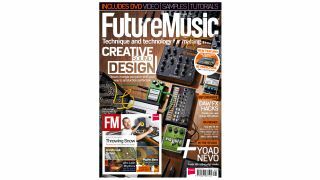 In the new issue of Future Music we're trying to strike a balance between the two, bringing you features packed not only with studio science, but also plenty of ideas to help you bend and break the rules to creative ends. We start with our sound mangling masterclass, Creative Sound Design, in which we show you how to distort, shift and edit your way to unique sounds. Then, in DAW Effects Hacks, we show you how to turn even the simplest of processors into complex bespoke effects chains. We've also introduced a brand new feature this issue, Producer's Guide To.... Here we'll be bringing you a whole new batch of in-depth tutorials each month, focusing on the most powerful, exciting and widely-used instruments and effects, to help you get the most out of your gear. We kick off with an extensive Maschine beat-making masterclass, with project files, samples and audio examples to guide you along. Get all this, plus loads more tutorials, artist interviews and the latest gear reviews in the August issue of FM. Start a 30-day trial digital subscription today and get this issue - including all samples, files and downloads - all for free! Creative Sound Design - We show you how to transform, distort and pitch-shift sounds out of their original context to create your own totally unique sound pallette. DAW Effects Hacks - Learn how to create complex and completely customisable effects processors out of any DAW's basic tools. Producer's Guide To... Maschine - Part one: building beats. Our new series of in-depth production guides kicks off with a masterclass for users of Native Instruments' hybrid music machine. In The Studio With Throwing Snow - The fast-rising producer invites us into his London studio to guide us through the gear and techniques behind his debut album Mosaic, and breaks down his track The Tempest on video. Yoad Nevo - Producer for the Pet Shop Boys, Moby and Goldfrapp, and plug-in developer for Waves, gives us a tour of his hi-tech Nevo Sound studio. Classic Album: Playgroup - Trevor Jackson relives the production of his eclectic, star-studded debut as Playgroup.